Montage of Telangana. Clockwise from top left: Charminar, painting of Lord Rama at Bhadrachalam, Kacheguda Railway Station, Bhongir Fort, Buddha statue in Hussain sagar, NTPC Ramagundam Super Thermal Power Station. Clockwise from top left: Charminar, painting of Lord Rama at Bhadrachalam, Kacheguda Railway Station, Bhongir Fort, Buddha statue in Hussain sagar, NTPC Ramagundam Super Thermal Power Station. Telangana ( /tɛlənˈɡɑːnə/) is a state in the Southern region of India. It has an area of 114,840 km2. Most of it was part of the princely state of Hyderabad (Medak and Warangal Divisions), which was ruled by the Nizams during the British Raj until 1947, and later until 1948, when it joined the Union of India. In 1956, Hyderabad state was dissolved and Andhra State was merged with the Telangana region of the state of Hyderabad to form the state of Andhra Pradesh. On 2 June 2014, Telangana became the 29th state of India, consisting of the ten north-western districts of Andhra Pradesh with Hyderabad as its capital. The city of Hyderabad will continue to serve as the joint capital for Andhra Pradesh and the successor state of Telengana for a period of ten years. Telangana is bordered by the states of Andhra Pradesh to the south and east, Maharashtra to the north and north-west, Karnataka to the west and Chhattisgarh to the north-east. Telangana has an area of 114,840 square kilometres (44,340 sq mi), and a population of 35,286,757 (2011 census). Hyderabad, Warangal, Nizamabad, Karimnagar and Ramagundam are the major cities in the state. The name Telangana is thought to have been derived from the word Trilinga, as in Trilinga Desa, which translates to "the country of the three lingas". According to a Hindu legend, Shiva descended in lingam form on three mountains, Kaleshwaram, Srisailam and Draksharama, which marked the boundaries of the Trilingadesa, later called Telinga, Telunga or Telugu. The name "Telangana" was designated to distinguish the predominantly Telugu-speaking region of the erstwhile Hyderabad State from its predominantly Marathi-speaking one, Marathwada. One of the earliest uses of a word similar to Telangana can be seen in a name of Malik Maqbul (14th century C.E. ), who was called the Tilangani, which implies that he was from Tilangana. He was the commander of Warangal Fort (Telugu Kaṭaka Pāludu). The Satavahana dynasty had its roots in Koti Lingala on the banks of the Godavari River, in present day Karimnagar district. The Satavahana dynasty (230 BCE to 220 CE) became the dominant power in the area. It originated from the lands between the Godavari and Krishna rivers. 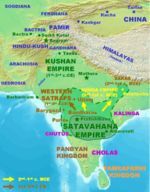 After the decline of the Satavahanas, various dynasties, such as the Vakataka, Vishnukundina, Chalukya, Rashtrakuta and Western Chalukya, ruled the area. The area experienced its golden age during the reign of the Kakatiya dynasty that ruled most parts of what is now Andhra Pradesh and Telangana from 1083 to 1323 CE. Ganapatideva, who came to power in 1199, was known as the greatest of the Kakatiyas, and the first after the Satavahanas to bring the entire Telugu area under one rule. He put an end to the rule of the Telugu Cholas, who accepted his suzerainty in the year 1210. He established order in his vast dominion that stretched from the Godavari delta in the east to Raichur (in modern day Karnataka) in the west and from Karimnagar and Bastar (in modern day Chhattisgarh) in the north to Srisailam and Tripurantakam, near Ongole, in the south. It was during his reign that the Golkonda fort was constructed. Rudrama Devi and Prataparudra were prominent rulers from the Kakatiya dynasty. The dynasty weakened with the attack of Malik Kafur in 1309 and was dissolved with the defeat of Prataparudra by the forces of Muhammad bin Tughluq in 1323. The area came under the Muslim rule of the Delhi Sultanate in the 14th century, followed by the Bahmani Sultanate. Quli Qutb Mulk, a governor of Golkonda, revolted against the Bahmani Sultanate and established the Qutb Shahi dynasty in 1518. On 21 September 1687, the Golkonda Sultanate came under the rule of the Mughal emperor Aurangzeb after a year-long siege of the Golkonda fort. In 1712, Qamar-ud-din Khan was appointed to be viceroy of the Deccan with the title Nizam-ul-Mulk (meaning "Administrator of the Realm"). In 1724, he defeated Mubariz Khan to establish autonomy over the Deccan Suba and took the name Asif Jah, starting what came to be known as the Asif Jahi dynasty. He named the area Hyderabad Deccan. Subsequent rulers retained the title Nizam ul-Mulk and were called Asif Jahi nizams or nizams of Hyderabad. The Medak and Warangal divisions were ruled by the nizams. When Asif Jah I died in 1748, there was political unrest due to contention for the throne among his sons, who were aided by opportunistic neighbouring states and colonial foreign forces. In 1769, Hyderabad city became the formal capital of the nizams. Nizam signed a subsidiary alliance in 1799 with British and lost its control over the state's defence and foreign affairs. Hyderabad State became a princely state among the presidencies and provinces of British India. Nagarjuna Sagar Dam (In Urdu: نگارجنا ساگر ڈیم) is a masonry dam on the Krishna River at Nagarjuna Sagar in the border of Nalgonda district of Telangana State and Guntur District of Andhra Pradesh State, India. The proposal to construct a dam to use the excess waters of the Krishna river was planned by the British Engineers in 1903 on the supervision of Hyderabad Nizams. Telangana was the seat of numerous dynasties. Chowmahalla Palace was home to the nizams of Hyderabad. When India became independent from the British Empire in 1947, the nizam of Hyderabad did not want to merge with the Indian Union and wanted to remain independent under the special provisions given to princely states. The government of India annexed Hyderabad State on 17 September 1948 in Operation Polo. The central government appointed a civil servant, M. K. Vellodi, as first chief minister of Hyderabad State on 26 January 1950. He administered the state with the help of English educated bureaucrats from Madras State and Bombay State, who were part of British India and familiar with Indian system unlike the bureaucrats of Hyderabad state who used completely different administrative system from British India and used Urdu as the state language. In 1952, Dr. Burgula Ramakrishna Rao was elected chief minister of Hyderabad State in the first democratic election. During this time, there were violent agitations by some Telanganites to send back bureaucrats from Madras state, and to strictly implement rule by natives of Hyderabad. Meanwhile, Telugu-speaking areas in the Northern Circars and Rayalaseema regions were carved out of the erstwhile Madras state as a result of the 'fast unto death' protest by Potti Sreeramulu to create Andhra State in 1953. The Telangana Rebellion was a peasant revolt supported by the communists. It took place in the former princely state of Hyderabad between 1946 and 1951. It was led by the Communist Party of India (CPI). The revolt began in the Nalgonda district against the feudal lords of Reddy and Velama castes. It quickly spread to the Warangal and Bidar districts. Peasant farmers and labourers revolted against the local feudal landlords (jagirdars and deshmukhs) and later against the king of Hyderabad State. The violent phase of the movement ended after the central government sent in the army. Starting in 1951, the CPI shifted to a more moderate strategy of seeking to bring communism to India within the framework of Indian democracy. In December 1953, the States Reorganisation Commission (SRC) was appointed to form states on linguistic bases. An agreement was reached between Telangana leaders and Andhra leaders on 20 February 1956 to merge Telangana and Andhra with promises to safeguard Telangana's interests. After reorganisation in 1956, the region of Telangana was merged with Andhra State to form Andhra Pradesh. Following the Gentlemen's agreement, the central government established a unified Andhra Pradesh on 1 November 1956. There have been several movements to invalidate the merger of Telangana and Andhra, major ones occurring in 1969, 1972, and 2009. The movement gained momentum over decades for a new state of Telangana. On 9 December 2009 the government of India announced process of formation of Telangana state. Violent protests led by politicians raised in the Coastal Andhra and Rayalseema regions immediately after the announcement, and the decision was put on hold on 23 December 2009. The state of Telangana was officially formed on 2 June 2014. Kalvakuntla Chandrashekar Rao was chosen as the first chief minister of Telangana. Hyderabad will remain as the joint capital of both Telangana and Andhra Pradesh for a period of 10 years. Telangana is situated on the Deccan Plateau, in the central stretch of the eastern seaboard of the Indian Peninsula. It covers 114,800 square kilometres (44,300 sq mi). The region is drained by two major rivers, with about 79% of the Godavari River catchment area and about 69% of the Krishna River catchment area, but most of the land is arid. Telangana is also drained by several minor rivers such as the Bhima, the Manjira and the Musi. The annual rainfall is between 900 to 1500 mm in northern Telangana and 700 to 900 mm in southern Telangana, from the southwest monsoons. Various soil types abound, including chalkas, red sandy soils, dubbas, deep red loamy soils, and very deep b.c. soils that facilitate planting mangoes, oranges and flowers. About 45% of the forest area of Andhra Pradesh is located in five districts of Telangana. Wildlife Sanctuaries in Telangana include Eturunagaram Wildlife Sanctuary and Pakhal Wildlife Sanctuary in Warangal District, Kawal Wildlife Sanctuary and Pranahita Wildlife Sanctuary in Adilabad district, Kinnerasani Wildlife Sanctuary in Khammam district, Manjira Wildlife Sanctuary in Medak district, Nagarjunsagar-Srisailam Tiger Reserve in Nalgonda and Mahbubnagar districts and in Andhra Pradesh, Pocharam Wildlife Sanctuary in Medak and Nizamabad districts, Shivaram Wildlife Sanctuary in Karimnagar district, and Siwaram Wildlife Sanctuary in Adilabad and Karimnagar districts. The main players in the regional politics are the Telangana Rashtra Samithi, Telugu Desam Party and Indian National Congress. Following the Telangana Legislative Assembly Election in 2014, the Telangana Rashtra Samithi under Kalvakuntla Chandrashekar Rao was elected to power. According to the Backward Regions Grant Fund 2009–10, 13 backward districts are located in Andhra Pradesh: nine (all except Hyderabad) are from Telangana and the rest are from other regions. The religious makeup of Telangana is 86% Hindu, 12.4% Muslim, and 1.2% Christian, and 0.4% others. About 76% of the population of Telangana speak Telugu, 12% speak Urdu, and 12% speak other languages. Before 1948, Urdu was the official language of Hyderabad State, and due to a lack of Telugu-language educational institutions, Urdu was the language of the educated elite of Telangana. After 1948, once Hyderabad State joined the new Republic of India, Telugu became the language of government, and as Telugu was introduced as the medium of instruction in schools and colleges, the use of Urdu among non-Muslims decreased. According to the 2011 census, Telangana literacy rate is 67.22%. Male literacy and female literacy are 75.6% and 58.77% respectively. Hyderabad district leading with 80.96% and Mahboobnagar district at the bottom with 56.06%. Telangana culture combines cultural customs from Persian traditions embedded during Moghuls and Nizams rule with prominent and predominantly south Indian traditions and customs. There are also extensive coal deposits, which are excavated by the Singareni Collieries Company, for power generation and industrial purposes. There are limestone deposits in the area, which are utilised by cement factories. Telangana also has deposits of bauxite and mica. Kothagudem, Jammikunta, Palwancha are amongst the industrial towns in the state. The state is well connected other states with road, rail and airways. It does not have seaport transportation. The Telangana State Road Transport Corporation (TSRTC) is the major public transport corporation that connects all the cities and villages. Mahatma Gandhi Bus Station (M.G.B.S) in Hyderabad is one of the largest bus stand in Asia. Jubilee Bus Station in Secunderabad serves inter city bus services. Asia's biggest Inter City Bus Terminal (ICBT) is being built in Miyapur (Hyderabad), which would house nearly 200 bus bays and for parking nearly 1,000 buses. Rajiv Gandhi International Airport is an international airport in the city of Hyderabad. It is the largest airport in the state and one of the busiest airports nationwide. The government also has plans to start airports in other cities: Warangal, Nizamabad, Karimnagar, Ramagundam and Kothagudem. Warangal has a domestic airport which was established in the year 1930 during Nizam period. All the exports and imports of Azam Jahi Mills, Warangal were done through the Warangal Airport. Sports are Cricket, Tennis, Badminton, Kabaddi. The Hyderabad cricket team is represented in the Ranji Trophy and had won twice. The Rajiv Gandhi International Cricket Stadium is the home ground of Hyderabad cricket team. It hosts international as well as domestic matches. The Sunrisers Hyderabad, an Indian Premier League franchise, is based in Hyderabad. Other stadiums include Gachibowli Athletic Stadium and G. M. C. Balayogi Athletic Stadium. ^ a b "Population of Telangana" (PDF). Telangana government portal. p. 34. http://www.telangana.gov.in/Telangana%20Statistical%20Abstract%20May%202014/2%20Demography.pdf. Retrieved 11 June 2014. ^ "Notification" (PDF). The Gazette of India. Government of India. 4 March 2014. http://www.egazette.nic.in/WriteReadData/2014/158365.pdf. Retrieved 4 March 2014. ^ "Population". Government of Andhra Pradesh. http://www.ap.gov.in/Other%20Docs/Population.pdf. Retrieved 30 May 2014. ^ "A grammar of the Teloogoo language, commonly termed the Gentoo, peculiar to the Hindoos inhabiting the north eastern provinces of the Indian peninsula (page iii)". Alexander Duncan Campbell. Sashachellum, 1816. http://books.google.com/books?id=PubopwMmteIC&lpg=PR3&ots=KOYt98TTXz&pg=PR3#v=onepage&q&f=false. Retrieved 10 October 2012. ^ “India Today • An encyclopedia of life in the Republic” • Vol. 1. Arnold P. Kaminsky and Roger D. Long, editors. ABC ‑ CLIO. ^ Sri Marana Markandeya Puranamu, ed. G. V. Subrahmanyam, 1984, Andhra Pradesh Sahitya Academy, Hyderabad. ^ a b c d Ratnakar Sadasyula (4 March 2014). "A brief history of Telangana and Andhra Pradesh". DNA. http://www.dnaindia.com/analysis/standpoint-a-brief-history-of-telangana-and-andhra-pradesh-1966737. Retrieved 2 June 2014. ^ Penta Sivunnaidu (2004). Kākati Ganapatideva and His Times, A.D. 1199–1262. Kalpaz Publications. ^ Richards, J. F. (1975). "The Hyderabad Karnatik, 1687–1707". Modern Asian Studies 9 (2): 241–260. DOI:10.1017/S0026749X00004996. Retrieved on 20 April 2012. ^ a b "Asif Jahi Dynasty (1724–1948)". mahabubnagar.tripod.com. http://mahabubnagar.tripod.com/Nizam_Dynasty.htm. Retrieved 2 June 2014. ^ "Post-Independence Era". Associated Press. http://www.aponline.gov.in/quick%20links/hist-cult/history_post.html. Retrieved 2 June 2014. ^ "1952: Hyderabad incidents". The Hindu. 6 September 2002. http://hindu.com/2002/09/06/stories/2002090603210900.htm. Retrieved 14 July 2014. ^ a b "Post-Independence Era". Government of Andhra Pradesh. http://www.aponline.gov.in/quick%20links/hist-cult/history_post.html. Retrieved 14 September 2010. ^ "After Sriramulu, Andhra State". The Hindu. 18 December 2002. http://www.hindu.com/2002/12/18/stories/2002121802120900.htm. Retrieved 3 June 2014. ^ "1953: May Andhra, and India progress". The Hindu. 1 October 2003. http://www.hindu.com/2003/10/01/stories/2003100100050900.htm. Retrieved 14 July 2014. ^ Elliot, Carolyn M. (November 1974). "Decline of a Patrimonial Regime: The Telangana Rebellion in India, 1946–51". Journal of Asian Studies 34 (1): 24–47. DOI:10.2307/2052408. ^ "Declassify report on the 1948 Hyderabad massacre". http://swaminomics.org/declassify-report-on-the-1948-hyderabad-massacre/. Retrieved 25 September 2013. ^ "India • Communist Parties". Country Studies, USA. http://countrystudies.us/india/114.htm. Retrieved 3 June 2014. ^ "History of India". Indian Saga. http://indiansaga.com/history/postindependence/reorganization.html. Retrieved 3 June 2014. ^ "SRC sub committee said no decision on Visalandhra taken". The Indian Express (Google news archive). 1 February 1956. http://news.google.com/newspapers?nid=P9oYG7HA76QC&dat=19560201&printsec=frontpage. Retrieved 3 June 2014. ^ "Andhra Pradesh to be formed with safeguards to Telangana". The Hindu. 7 March 2006. http://www.hindu.com/2006/03/07/stories/2006030704410900.htm. Retrieved 3 June 2014. ^ "Andhra Pradesh formed". The Hindu. 2 November 2006. http://www.hindu.com/2006/11/02/stories/2006110200140901.htm. Retrieved 3 June 2014. ^ "How Telangana movement has sparked political turf war in Andhra". Rediff.com. 5 October 2011. http://www.rediff.com/news/report/how-telangana-movement-has-sparked-political-turf-war-in-andhra/20111005.htm. Retrieved 19 February 2012. ^ "Pro-Telangana AP govt employees threaten agitation". The Economic Times. 10 February 2012. http://articles.economictimes.indiatimes.com/2012-02-10/news/31046433_1_pro-telangana-telangana-employees-separate-statehood-demand. Retrieved 18 February 2012. ^ "Telangana bill passed in Lok Sabha; Congress, BJP come together in favour of new state..". Hindustan Times. http://www.hindustantimes.com/india-news/telanganathetroubledstate/parliament-adjourned-till-noon-over-telangana-issue/article1-1185194.aspx. Retrieved 18 February 2014. ^ "Telangana bill passed by upper house". The Times of India. http://timesofindia.indiatimes.com/telangana-bill-in-rajya-sabha/liveblog/30712218.cms. Retrieved 20 February 2014. ^ "The Andhra Pradesh reorganisation act, 2014". Ministry of law and justice, government of India. http://www.mha.nic.in/sites/upload_files/mha/files/APRegACT2014_0.pdf. Retrieved 3 March 2014. ^ Amarnath K Menon (1 June 2014). "Telangana is born, KCR to take oath as its first CM". THE INDIA TODAY GROUP (Hyderabad). http://indiatoday.intoday.in/story/telangana-braces-to-celebrate-its-birthday-celebrations-kcr/1/364724.html. Retrieved 14 July 2014. ^ "Administrative and Geographical Profile" (pdf). Telangana State Portal. p. 2. http://www.telangana.gov.in/Telangana%20Statistical%20Abstract%20May%202014/1%20ADMINISTRATIVE%20AND%20GEOGRAPHICAL%20PROFILE.pdf. Retrieved 14 July 2014. ^ "Characterization and Classification of Soils of Northern Telangana". Journal of Tropical Agriculture. p. 24. http://www.jtropag.in/index.php/ojs/article/viewFile/102/97. Retrieved 14 July 2014. ^ "A NOTE ON THE BACKWARD REGIONS GRANT FUND PROGRAMME". Ministry of Panchayati Raj. p. 13. http://www.nird.org.in/Brgf/doc/brgf_BackgroundNote.pdf. Retrieved 14 July 2014. ^ "Region-wise distribution of religious groups 2001" (PDF). Table 7.2 in page 381 of SKC report. http://pib.nic.in/archieve/others/2011/jan/d2011010502.pdf. Retrieved 3 June 2014. ^ "Minority Population Cenus". ANDHRA PRADESH STATE MINORITIES FINANCE CORPORATION. http://www.apsmfc.com/ministry-population-cenus.html. Retrieved 26 June 2014. ^ "Region-wise distribution of religious groups 2001" (PDF). Table 7.3 in page 393 of SKC report. http://pib.nic.in/archieve/others/2011/jan/d2011010502.pdf. Retrieved 3 June 2014. ^ "Urdu in Andhra Pradesh". Language in India. http://www.languageinindia.com/april2003/urduinap.html. Retrieved 22 January 2013. ^ "T-party today: India’s 29th state Telangana is born". The Times of India. http://timesofindia.indiatimes.com/india/T-party-today-Indias-29th-state-Telangana-is-born/articleshow/35912105.cms. Retrieved 3 June 2014. ^ "Literacy of Rural – Urban (Andhra Pradesh)". Government of India. http://www.censusindia.gov.in/2011-prov-results/paper2-vol2/data_files/AP/Chapter_VI.pdf. Retrieved 9 May 2014. ^ "Introduction". Singareni Collieries Company. http://scclmines.com/scclnew/our-business_products-and-services_introduction.asp. Retrieved December 2013. ^ "It will be TGSRTC from June 2". The Hindu. 16 May 2014. http://www.thehindu.com/todays-paper/tp-national/tp-andhrapradesh/it-will-be-tgsrtc-from-june-2/article6014676.ece. Retrieved 2 June 2014. ^ "citi-Charter". www.apsrtc.gov.in. Archived from the original on 17 September 2010. http://www.apsrtc.gov.in/Contact%20Us/Grievances/Citi-Chart.htm. Retrieved 19 August 2010. ^ "Andhra Pradesh • Natural Advantages". Governement of Andhra Pradesh. Archived from the original on 3 April 2009. http://www.aponline.gov.in/Quick%20links/apfactfile/naturaladvantages.html#Airways. Retrieved 3 March 2009. ^ "Miyapur bus terminal". The Times of India. 20 April 2014. http://timesofindia.indiatimes.com/city/hyderabad/At-last-Miyapur-bus-terminal-to-take-off/articleshow/19266730.cms. ^ "History". South Central railway. http://www.scr.indianrailways.gov.in/view_section.jsp?lang=0&id=0,1,283. Retrieved 11 June 2014. ^ "History". South Central Railway. http://www.scr.indianrailways.gov.in/view_section.jsp?lang=0&id=0,1,283. Retrieved 2 June 2014. ^ "About Andhra Pradesh". Hyderabadi search. http://www.hyderabadisearch.com/AboutAndhrapradesh.aspx. Retrieved 2 June 2014. Virendra Kumar. "Committee on Telangana surpluses, 1969 – Report by Justice Bhargava". Committees and commissions in India, 1947–1973. 9. New Delhi: D. K. Publishing House. p. 175. ISBN 8170221978. http://books.google.com/books?id=mISVwxcF5asC&ots=knn_jTsLVn&pg=PA175. Retrieved December 2013. Sarojini Regani (1986). Nizam – British Relations 1724–1857. New Delhi: Concept Publishing Company. ISBN 8170221951. http://books.google.com/books?id=9Fb26pWqhScC&printsec=frontcover. Retrieved December 2013. Duncan B. Forrester (Spring 1970). "Subregionalism in India: The Case of Telangana" 43: 5–21. Retrieved on December 2013. Karen Leonard (May 1971). "The Hyderabad Political System and its Participants" 30: 569–582. Retrieved on December 2013. This page uses content from the English language Wikipedia. The original content was at Telangana. The list of authors can be seen in the page history. As with this Familypedia wiki, the content of Wikipedia is available under the Creative Commons License.